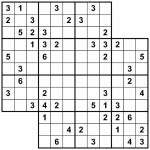 Here’s an interesting Samurai Sudoku variant. There are two 9×9 grids densely overlaid, so they share four of their 9×9 boxes in common – and not just this, but the numbers to place are one “1″, two “2″s, three “3″s and then one each of 4, 5 and 6. In other words, can you place 1, 2, 2, 3, 3, 3, 4, 5, 6 into each row, column and 3×3 box of each of the two underlying 9×9 grids? It might take a bit of getting your head around to start with, but it’s definitely do-able! Good luck!